The following is a brief list of the main features in MG-SOFT MIB Browser. Note that the software is available in different editions and that some of the described features are not available in all editions. For details, compare availability of certain features in different editions of MG-SOFT MIB Browser Professional. Support for SNMPv1, SNMPv2c and SNMPv3 protocols over UDP or TCP over IPv4 transport (screen shot). Support for the IPv6 protocol (Internet Protocol Version 6). MIB Browser can perform all SNMP operations also over IPv6 protocol. Any version of SNMP over UDP or TCP can be used also over IPv6 transport (screen shot). Support for all standard SNMPv3 USM security modes: HMAC-MD5 and HMAC-SHA authentication; CBC-DES and CFB-AES-128 privacy protocols. In addition, CFB-AES-192, CFB-AES-256 and CBC-3DES privacy protocols are also supported in SNMPv3 USM. 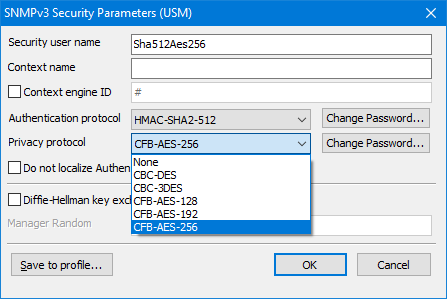 These encryption protocols offer stronger security than CBC-DES and CFB-AES-128 privacy protocols, especially when used in combination with HMAC-SHA-2 family of authentication protocols (screen shot). Support for new HMAC-SHA-2 authentication protocols in SNMPv3 USM, as specified in RFC 7860. The HMAC-SHA-2 authentication protocols provide a higher level of security than original HMAC-MD5-96 and HMAC-SHA-96 authentication protocols specified in RFC 3414. 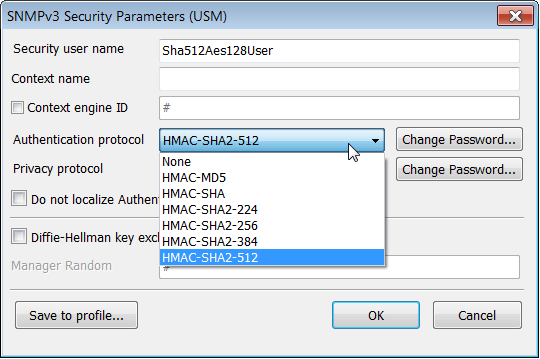 The supported HMAC-SHA-2 authentication protocols are: HMAC-SHA-2-224, HMAC-SHA-2-256, HMAC-SHA-2-384 and HMAC-SHA-2-512	(screen shot). Support for the DOCSIS Diffie-Hellman key ignition extension to SNMPv3 USM, for seamless management access to the DOCSIS-based SNMP agents, like cable modems, cable modem termination systems, set-top boxes, etc. (screen shot). MG-SOFT MIB Browser now implements the Transport Security Model (TSM) and supports SNMPv3 over TLS and SNMPv3 over DTLS protocol, as specified in RFC 6353. MIB Browser can perform all retrieval and modification operations also by using SNMP over (D)TLS. (D)TLS provides authentication, data integrity, and privacy at the transport layer by establishing a secure "tunnel" between two SNMP entities, over which SNMP messages are exchanged. (screen shot1) (screen shot2). Support for all SNMP protocol operations: GET, GET NEXT, GET BULK and SET (screen shot). Support for receiving SNMPv1, SNMPv2c and SNMPv3 TRAP messages as well as SNMPv2c and SNMPv3 INFORM messages. MIB Browser supports simultaneously receiving notifications on arbitrary UDP IPv4 and IPv6 ports. During the startup, the software verifies notification reception status (screen shot). Supports sending SNMPv1, SNMPv2c and SNMPv3 TRAP and SNMPv2c and SNMPv3 INFORM messages. 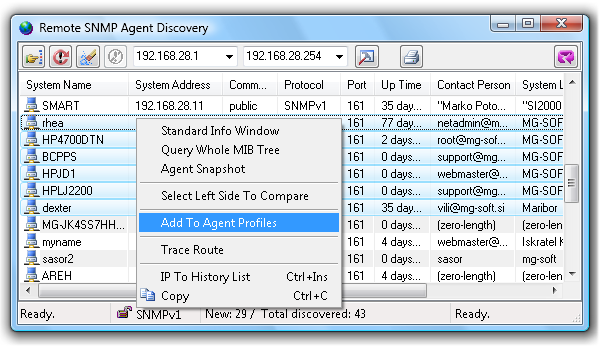 SNMP agent profiles. To facilitate managing different SNMP agents, MIB Browser lets you configure and use SNMP agent profiles. Each profile stores all parameters required for accessing and managing a particular SNMP agent on the network. 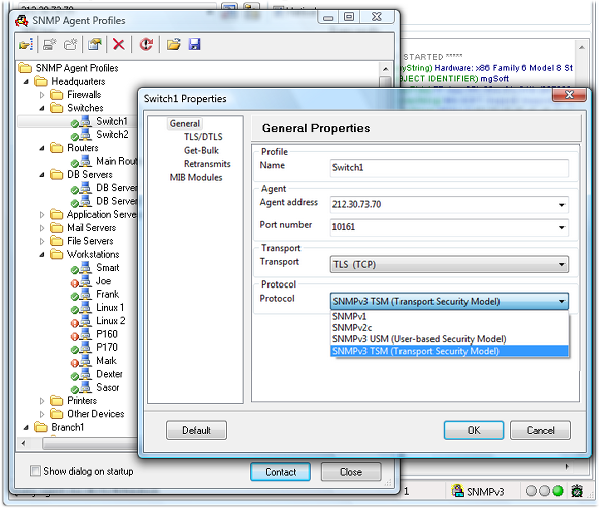 SNMP Agent Profiles window can be accessed throughout the application (screen shot). MG-SOFT MIB Browser implements a convenient Import MIB feature that lets you select vendor-specific MIB definition files on disk and load them into MIB Browser. During the import process MIB definition files are scanned for dependencies and compiled behind the scenes using the command line version of MG-SOFT MIB Compiler. 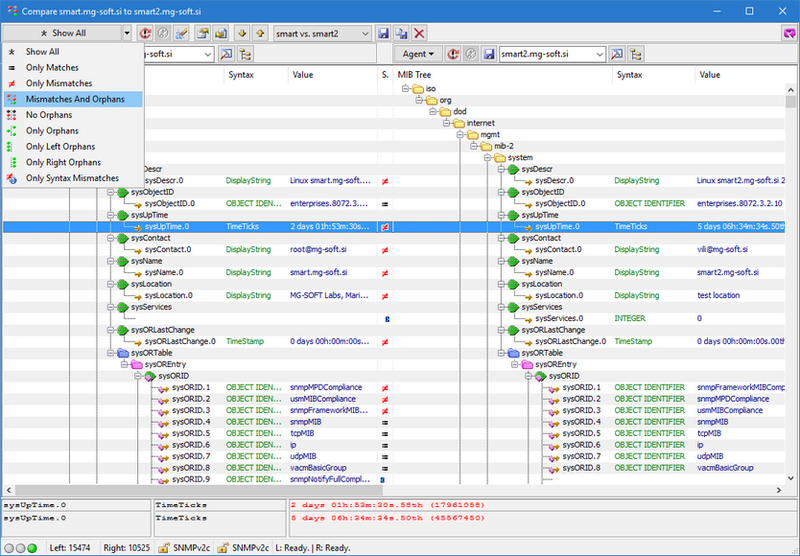 Compiled MIB modules are automatically saved and loaded in MIB Browser, so one can start managing devices that implement imported MIB module(s) quickly and effectively (screen shot). 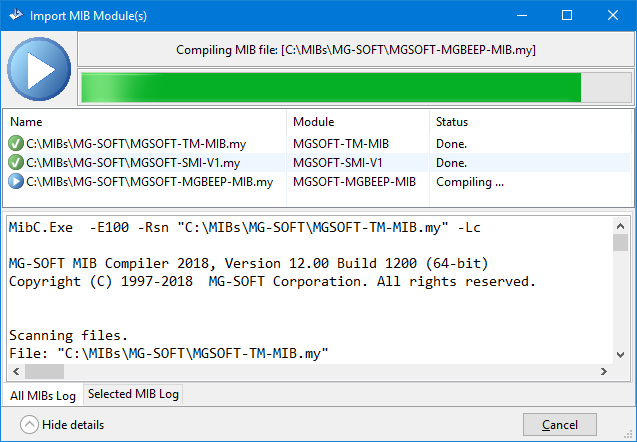 In addition, the enclosed MG-SOFT MIB Compiler lets you debug and fix incorrect MIB definitions in the built-in MIB editor. MIB Browser comes with a set of 379 standard IETF and IANA MIB modules, with roughly 28000 OID, textual convention and SNMP Trap definitions. The enclosed standard MIB modules can be loaded in the "MIB" tab of the main window. Besides, the software lets you save loaded MIB files to MIB groups, so that at any later time the whole group of MIB modules can be loaded at once (screen shot). 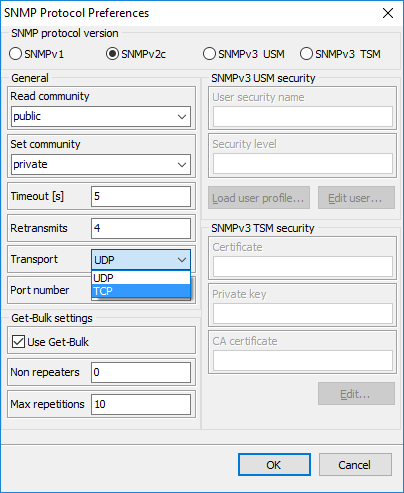 Managing SNMPv3 USM user configuration on remote SNMP agents. 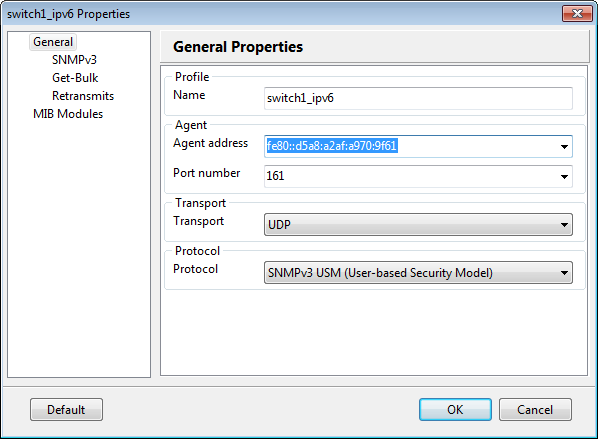 MIB Browser provides a convenient and user-friendly interface for managing SNMPv3 USM users on remote SNMPv3 agents. The USM user management operations include 'cloning' SNMPv3 USM users, changing their secret authentication and privacy keys, as well as enabling, disabling and deleting USM users (screen shot). Generic SNMP Trace window displays SNMP messages exchanged between MIB Browser and SNMP agents. With this feature you can trace SNMP requests sent from any MIB Browser's window, responses to sent SNMP requests as well as received SNMP Trap and Inform notification messages. Traced SNMP messages are displayed in raw hexadecimal dump format as well as in the decoded, human-readable format. All in all, the Generic SNMP Trace window is particularly useful for debugging when developing SNMP agents and for resolving problems in queried SNMP agents (screen shot). Selectable binding interface. On computers with two or more network cards, the user can select which network card (interface) should be used by MIB Browser for sending out SNMP requests, both for IPv4 and IPv6 (screen shot). Supports multiple variable bindings in all SNMP protocol PDUs: GET, GET NEXT, GET BULK, SET, TRAP and INFORM (screen shot). Performing multiple operations. The Multiple Operations window mimics scripting in a sense that you can add any number of SNMP operations to it (GET, GET NEXT, SET, TRAP, etc. ), each containing one or more variable bindings, and then start executing these operations against a specified SNMP agent with a single click of a button (screen shot). MIB tree node colors reflect the node access type. By default, MIB tree node names are colored according to the node access/max.access value defined in the MIB (e.g. read-only, read-write, read-create, not-accessible,...). 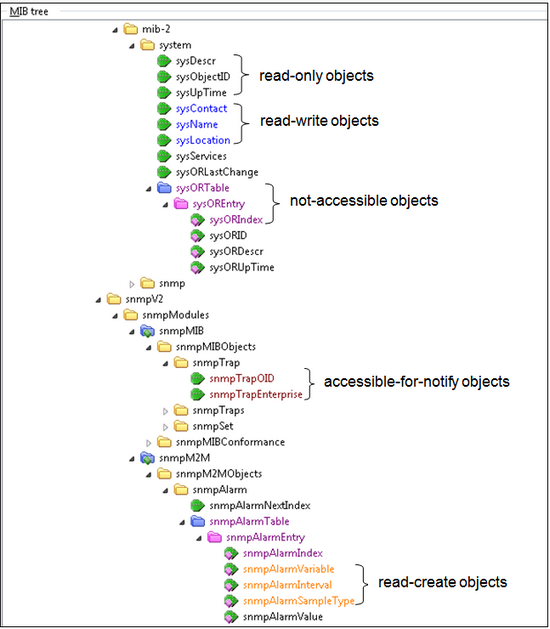 This way, you can tell at a glance which nodes (i.e., corresponding MIB object instances) are writable, creatable, not accessible, etc. Node access colors can be adjusted to your taste in the program preferences (screen shot). Support for UHD/4K displays. MIB Browser and all bundled applications (Visual MIB Builder, MIB Explorer, MIB Compiler) are now "aware" of the system display DPI settings (on Windows and Mac OS) and automatically scale the size of their GUI components (dialogs, buttons, icons) and text accordingly to achieve the best visibility and usability also on today's high pixel density (HiDPI) displays. SNMP agent snapshots. 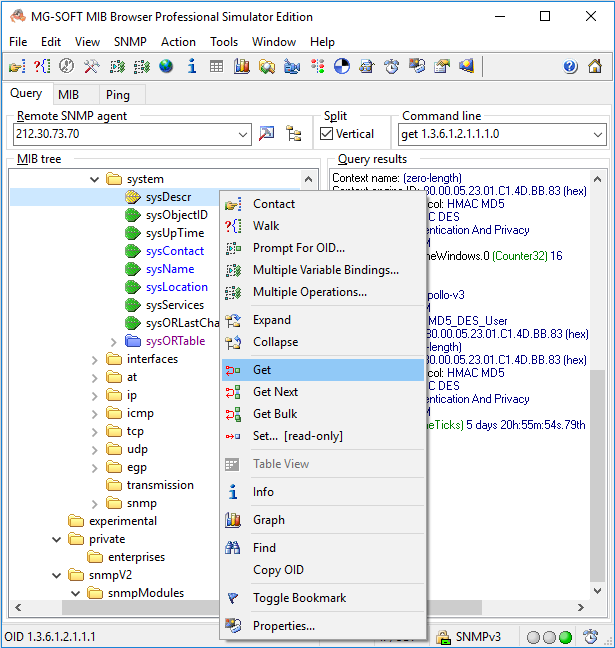 MIB Browser incorporates a special window for taking and viewing SNMP agent snapshots. An agent snapshot is a MIB tree-like presentation of MIB objects and MIB object instances, including the syntaxes and values of object instances, as retrieved from an SNMP agent at a given time by means of the Walk operation (screen shot). Built-in SNMP agent simulator. 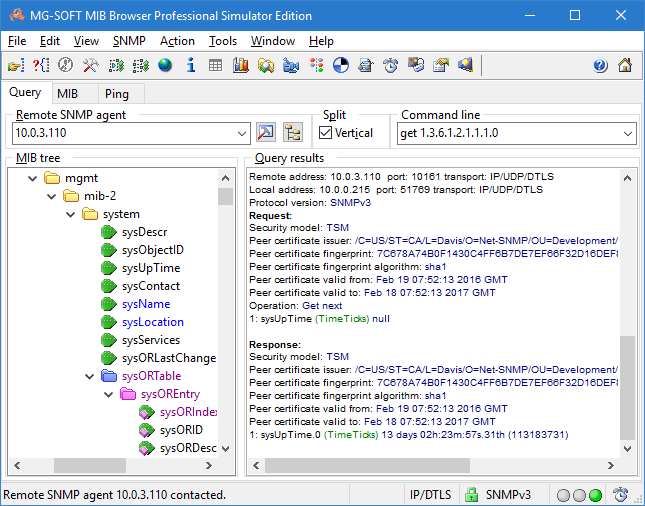 MIB Browser Professional Simulator Edition lets you take a snapshot of an SNMP agent on the network and then simulate this agent on the computer where MIB Browser runs (screen shot). 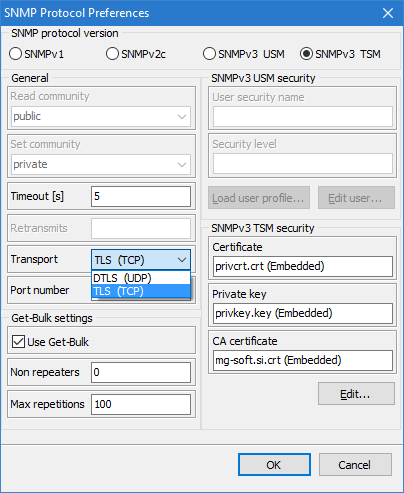 MIB Browser can simulate an SNMP agent that listens on a user specified UDP and TCP ports and IPv4 and/or IPv6 addresses and "speaks" all versions of the SNMP protocol supported by MIB Browser, including SNMPv3 USM and TSM (SNMPv3 over TLS and SNMPv3 over DTLS, both over IPv4 and IPv6 transport protocols). 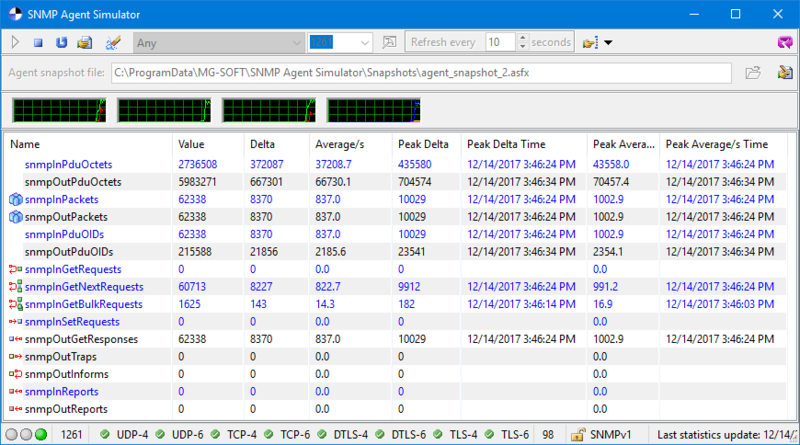 Comparing SNMP agent snapshots. MIB Browser lets you compare two SNMP agent snapshots side-by-side, showing implemented object instances including their syntax and value. Snapshots can be taken either from two different SNMP agents or from one SNMP agent at different times. Now you can specify what object instances implemented in SNMP agents you want to compare. Furthermore, you can save the entire comparison configuration as a session for future use (screen shot). Queried values are resolved and formatted according to the relevant TEXTUAL-CONVENTION and DISPLAY-HINT MIB definitions. 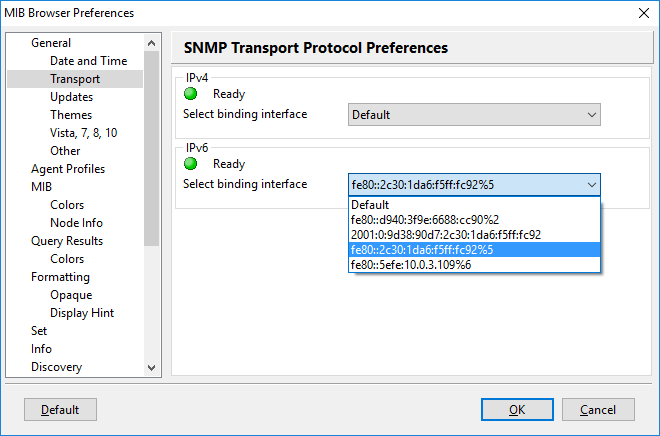 SNMP Set window for setting values in remote SNMP agents. Provides a convenient interface for selecting the relevant pre-defined values from MIB definitions (screen shot). MIB Module smart load feature. MIB Browser searches for compiled MIB modules and loads them on the fly, as needed for resolving queried values. MIB tree bookmarks for seamless navigation in the MIB tree. Remote SNMP Agent Discovery window for performing the remote SNMP agent discovery operation. 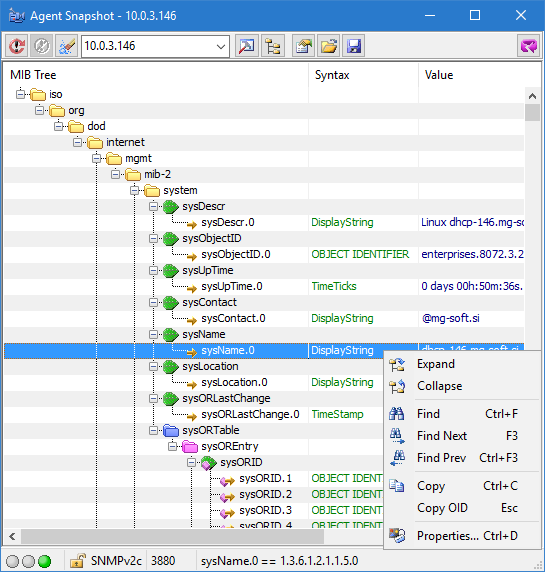 MIB Browser can be configured to discover SNMP devices that implement a given OID. Now, this window lets you select multiple discovered SNMP agents and start monitoring them in Info windows or create SNMP agent profiles for all discovered SNMP agents with a single command. Additionally, the window lets you take SNMP agent snapshots of multiple SNMP agents or select two SNMP agents and compare them in the Compare SNMP Agent Snapshots window (screen shot). Table View windows for viewing SNMP tables in columnar form. MIB Browser can open any number of Table View windows (screen shot). 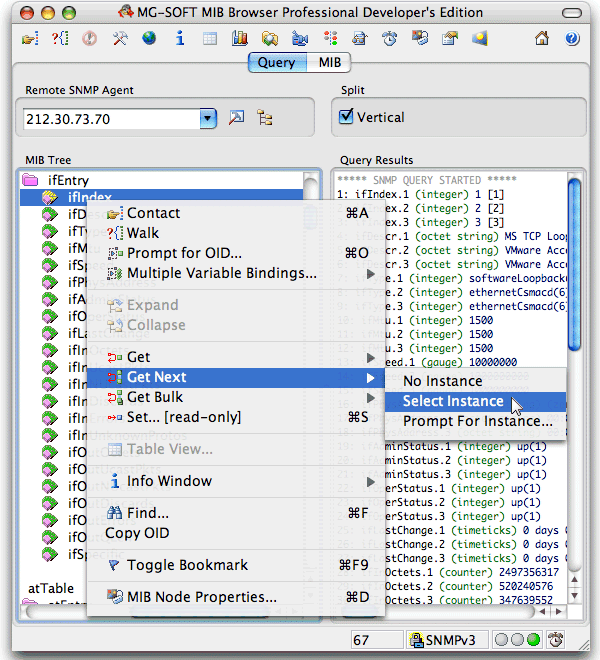 SNMP Table 'editor' with the Add Row feature. 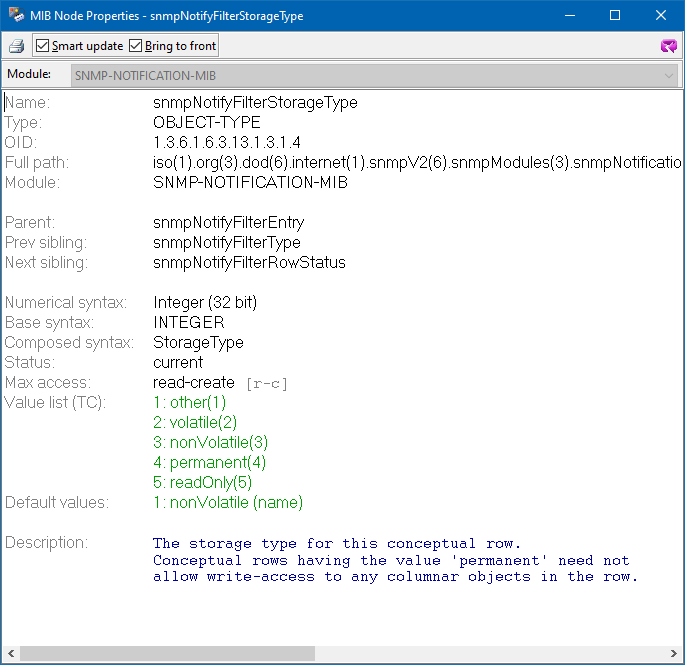 The SNMP Table View window now lets the user modify values of writable SNMP table object instances, and send the updated values to the agent, all at once. 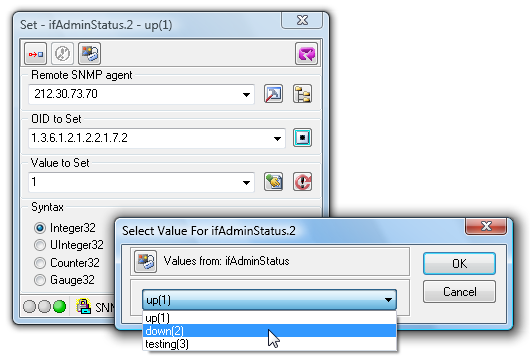 In the SNMP Table View window the user can now perform SNMP Add Row operation in a straightforward manner. 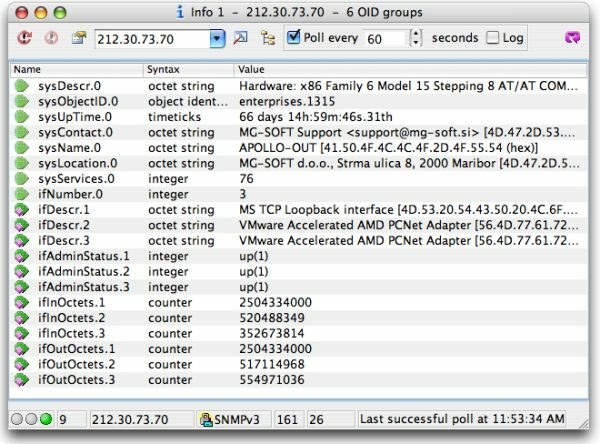 Info windows for monitoring arbitrary groups of OIDs on remote SNMP agents. MIB Browser can open a number of Info windows. Info windows can log retrieved values to CSV files that can be imported to spreadsheet or database applications for further processing (screen shot). 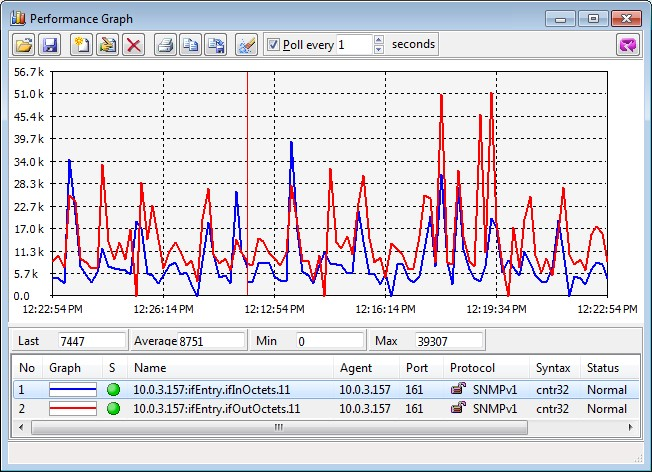 Performance Graph window for graphical monitoring of numerical OID values retrieved from a number of remote SNMP agents (screen shot). MIB Node Properties window for displaying the MIB node and MIB module properties. When displaying MIB node properties the Property window displays all SMI properties of the given node as defined in the MIB definition module (screen shot). 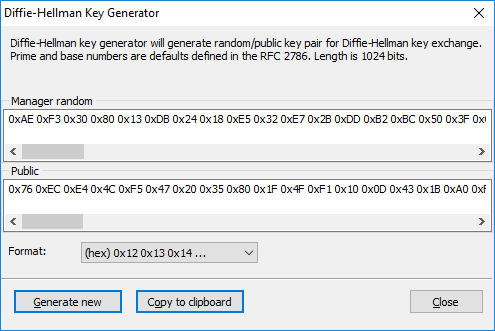 Diffie-Hellman key generator. 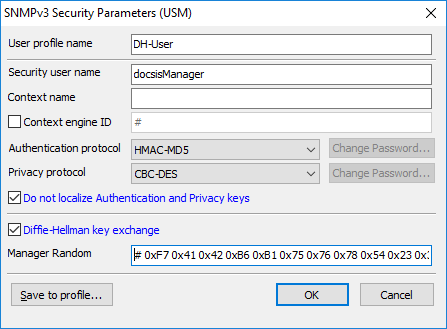 This utility lets you generate the manager random and public numbers that can be used for performing the Diffie-Hellman key ignition operation when accessing DOCSIS-based SNMPv3 agents (screen shot). ICMP Ping and traceroute commands for non-SNMP management operations. Flexible and robust application design. Intuitive and easy to use user interface incorporating the latest industry trends in the user interface design (screen shot). Significantly updated and enhanced User Manual with numerous hints and usage examples will help you get the most from MG-SOFT's MIB Browser Professional Edition. Compare features between various MG-SOFT's SNMP network management products.